The range of Kroon Oil products contains high quality motor oils and greases and is especially suitable for heavy agricultural applications. Tractors and agricultural equipment demand a considerable investment and therefore deserve the best protection. You must be able to count on your machines under all circumstances. 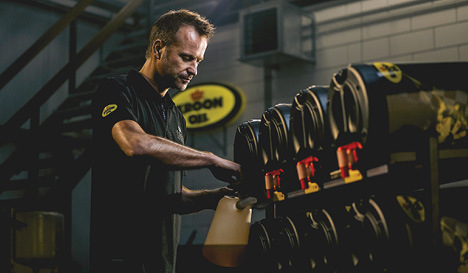 Kroon Oil lubricants are characterised by extremely high performance in the lubrication of mechanical components of tractors, agricultural machinery and other equipment for all seasons. The Agri range of Kroon Oil contains motor oils, gear oils and hydraulic oils. Your machine park largely determines the continuity of your business. Downtime is harmful for your business and brings additional costs. Equipment must therefore function optimally and technically well in order to work smoothly. In agriculture lubricants play an important role in improving performance, extending machine life and reducing emissions and fuel consumption. Kroon Oil's Super Tractor Oil Universal (STOU) range of oils is applicable for petrol engines, diesel engines (also for diesel turbines), transmissions and hydraulic systems. Agrifluid NHC is a high-quality universal tractor transmission oil (UTTO). Kroon Oil has specially developed this product for heavily loaded hydraulic and transmission systems (with or without wet braking) of the most common modern agricultural and earthmoving machines. All products of Kroon Oil have the official approvals from all leading vehicle manufacturers. Wondering what Kroon Oil products we sell? Find the best-selling products below.